Lacrosse is exploding in popularity across the country. As many people in the area are unfamiliar with the sport and frequently ask me if it is a safe sport, I thought it might be helpful to write about lacrosse injury and tips for prevention. Lacrosse is one of the oldest team sports in North America, and it is also one of the fastest growing sports in the country. According to the 2009 Participation Survey produced by US Lacrosse, more than 560,000 participants played lacrosse on organized teams in 2009 compared to approximately 250,000 in 2001. In the last year alone, more than 30,000 young athletes started playing the sport for the first time. 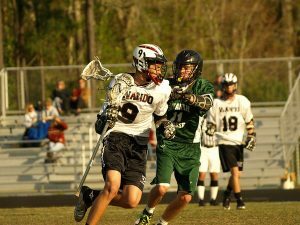 High school lacrosse is now a sanctioned sport in 21 states, and 60 teams played NCAA Division I men’s lacrosse in 2010. As lacrosse rapidly draws new players, many players and parents are inquiring about injuries that occur in this sport. Lacrosse is felt to be a relatively safe sport for both boys and girls. Men’s lacrosse is a contact sport where players are allowed to check into the body as a regular part of the game. In women’s lacrosse, contact to the head or body or within a 7-inch sphere around the player’s head is illegal. Consequently there are slightly different rules and protective equipment regulations for boys and girls. Even though it is a fairly safe sport, there are several tips that might keep players at all levels injury free. 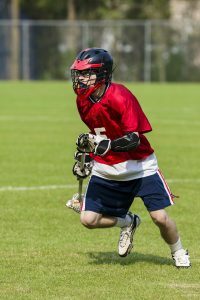 A study by Hinton et al., published in The American Journal of Sports Medicine in 2005, examines lacrosse injuries in high school-aged players over a three-year period. The authors found that ankle and knee ligament sprains were both the most frequent injuries and that they resulted in the most playing time lost. Teams and leagues might consider preseason and in-season injury prevention programs that can be incorporated into a team’s warm-up drills to try to minimize these injuries. Any existing injuries of the ankle and knee should be fully healed, and the player should have completed a full rehabilitation program prior to returning to play in order to minimize the chance of recurrent injuries. The same study by Hinton et al. mentioned earlier also noted a higher rate of injuries during summer camps than during the regular school seasons. This higher injury rate could be related to broader definitions of injuries, but it could also be from more players new to this sport participating. It also might reflect a looser interpretation of rules, more lax equipment monitoring, and less supervision of the players. Regardless, having athletic trainers to evaluate and treat injuries at these camps, in addition to utilizing them during the regular season, could be beneficial to determine if injuries are significant and to initiate treatment as quickly as possible for more serious injuries. Two studies published in The American Journal of Sports Medicine have demonstrated that thumb injuries are not uncommon in lacrosse. Goalkeepers can suffer fractures of the bones in the thumb with the ball hitting the tip of the thumb. Lacrosse gloves are designed to protect the dorsal surface of the fingers and the thumb. This location of the padding protects the tips of the four fingers but not the thumb. In one of these studies, it was noted that injuries to the thumb were more common in men’s lacrosse compared to men’s ice hockey and women’s lacrosse, which also involve stick handling and wearing gloves. One suggestion might be to protect the tip of the thumb with a plastic insert molded and attached outside the glove. Different forms of taping or splinting can be attempted and studied to see if these injuries can be better prevented. Equipment companies should continue to modify lacrosse gloves to better protect players’ thumbs. As women’s lacrosse does not involve physical contact with the body and head, the risk for a serious head injury, such as a concussion, is lower. However head and face lacerations can and do occur. Likewise, while eye injuries are rare, they can be extremely serious. US Lacrosse has a list of approved equipment for women’s lacrosse to minimize these risks. Safety advocates often argue that girls should wear helmets to minimize the chance of serious head injury, while critics of this idea point out that helmets could encourage more physical contact, similar to the boys’ game. Data continues to be accumulated for both men’s and women’s lacrosse. As this data is published, modifications can be made to the equipment requirements to best protect the head, face, and eyes of female lacrosse players. 1. Bowers AL, Horneff JG, Baldwin KD, Huffman GR, Sennett, BJ. Thumb injuries in intercollegiate men’s lacrosse. Am J Sports Med. 2010; 38: 527-531. 2. Elkousy HA, Janssen H, Ferraro J, Levin LS, Speer K. Lacrosse goalkeeper’s thumb: A preventable injury. Am J Sports Med. 2000; 28: 317-321. 3. Hinton RY, Lincoln AE, Almquist JL, Douoguih WA, Sharma KM. Epidemiology of lacrosse injuries in high school-aged girls and boys: A 3-year prospective study. Am J Sports Med. 2005; 33: 1305-1314. 4. Matz SO, Nibbelink G. Injuries in intercollegiate women’s lacrosse. Am J Sports Med. 2004; 32: 608-611. 5. US Lacrosse. 2009 US Lacrosse Participation Survey. 6. Yard EE, Comstock RD. Injuries sustained by pediatric ice hockey, lacrosse, and field hockey athletes presenting to United States emergency departments, 1990-2003. J Athletic Training. 2006; 41(4): 441-449. Could or should Jay Cutler have played?